Back in 2001 a Korean horror game under the name of White Day: The Labyrinth Named School was released by ROI Games. 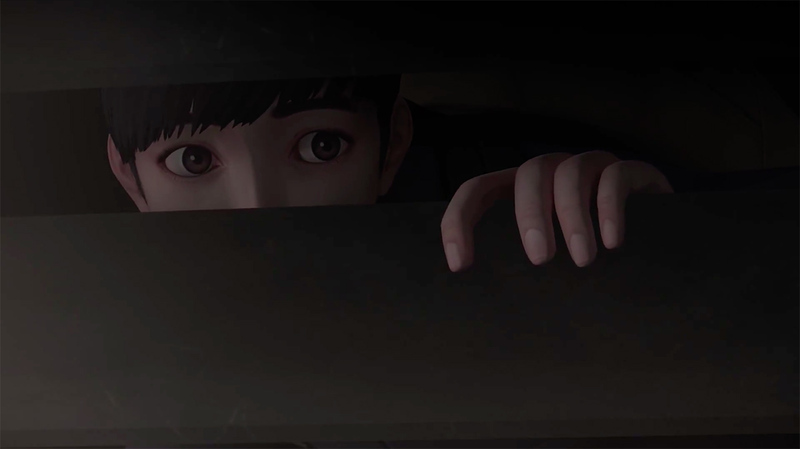 It features a school boy trying to surprise his crush on White Day (a Korean holiday similar to Valentine's Day, where people give their "Valentine" chocolates). He sneaks into the school at night to leave chocolates on her desk, but becomes entangled in the darker side of the school, now resembling a labyrinth of horrors. 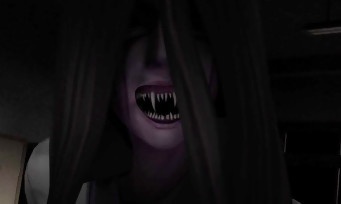 According to everyone that has played the game, White Day is terrifying. Of course, this means that it should be made even scarier with a release for virtual reality on PlayStation. Naturally. 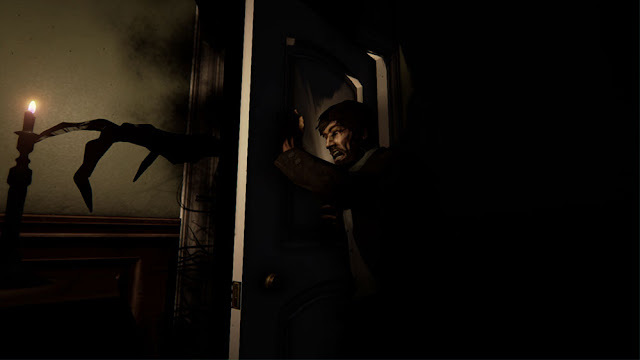 White Day was originally only slated to release in the East, but was then planned for a Western release in 2004 due to its popularity. Unfortunately, it never happened, and the hype died down. 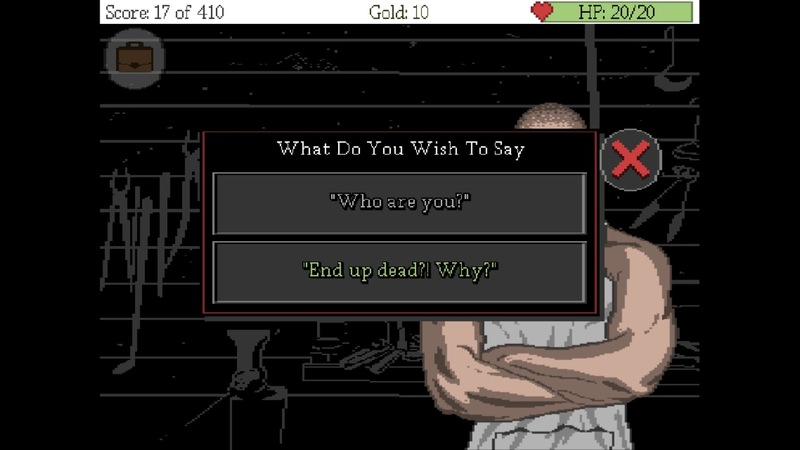 Then, thanks to a number of rough and/or near-perfect translations to English, the game blew up a few years later with horror gamers and YouTubers in the West. Fast forward to 2015, and as a result of the popularity with horror gamers, passionate folk that we are, White Day isn't just getting a Western release; it is also getting an improved version that will include new ghosts, improved graphics, sound effects and dialogue, and VR support. This VR version can actually be seen in the trailer above, and it actually looks pretty great. By which I mean, horrifying, obviously. 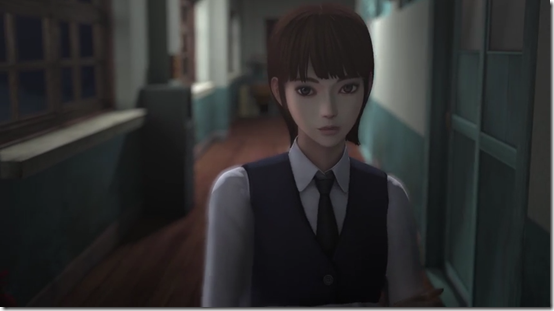 White Day: A Labyrinth Named School is going to be released on PlayStation 4, iOS, Android, and be updated on PC. The game will be released in Korea on November 19th, and come to international horror gamers in the near future, including VR support. At present, only the mobile versions will be dubbed with English, but if enough players want it, an English-dubbed version may also make its way to the other platforms. Personally, I feel that English subtitles with Korean language will keep the Asian horror at its finest, so I’d probably keep the subtitles regardless. More information on White Day can be its IndieDB page, where the original game can be downloaded for free, if you’d like to test your limits before the game comes to the West. Are you excited? I am. Just need to find a way to afford a virtual reality kit now... Who needs a soul anyway? I've never been to Japan, but it is a dream of mine to go, and possibly even live there for a while. The places seem so interesting, full of culture and life. In Yomawari, which translates to “Night Watch”, by Nippon Ichi Software, however, it all changes at night. 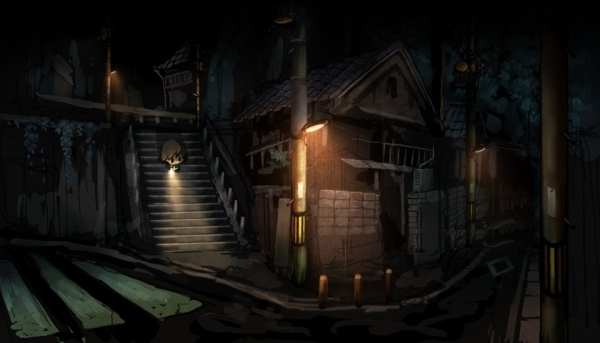 Yomawari tells the haunting tale of a little girl that loses her dog. Her older sister disappears into the night to try and find it, but neither return. Alone, and more than a little worried about her missing family, the little girl wanders into the darkness to find them. This is where we'll get to explore a beautiful, popular town turned surreal and eerie in the night. Armed with only a flashlight, you'll search the streets of Japan for clues of your sister and pet. You won't be alone on those streets, either. Black figures and strange creatures wait in the darkness, and if you decide to shine your light in their direction, they may just show you what they really are. Unfortunately, gathering the courage to search the darkness is the only way you'll be able to find the whereabouts of your family. If you like the sound of Yomawari, which I really do, more information may be found on the American Nippon IchiSoftware website, Facebook or Twitter. The game is currently released in Japan on the PlayStation Vita, but is likely to be released in the West in the near future. Are you ready to find your family? It's dark out there. Another day, another horror from KGames. I know, what were the chances that I'd find them both at the same time? Apparently 100%, but that's just me. 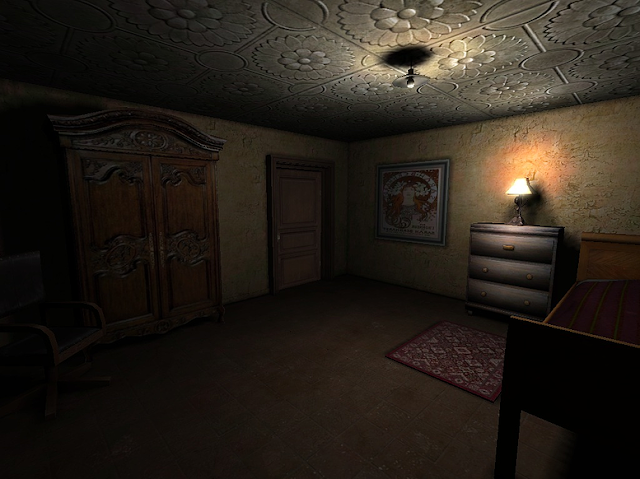 Today's horror is Baby Blues, described by some gamers a "Baby Slender." 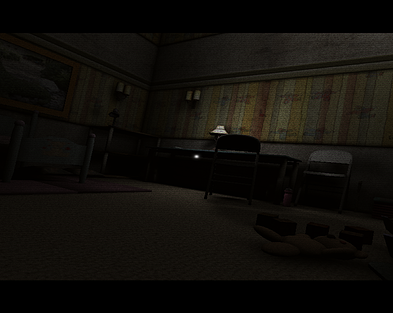 In Baby Blues, you play as Tommy, a toddler that wakes up one night to find that all of his teddies have gone missing. Determined, he leaves the safety of his bed and goes in search of them. His mission is to search his home to find all of his stuffed friends before making his way back to bed. Of course, it won't be easy. 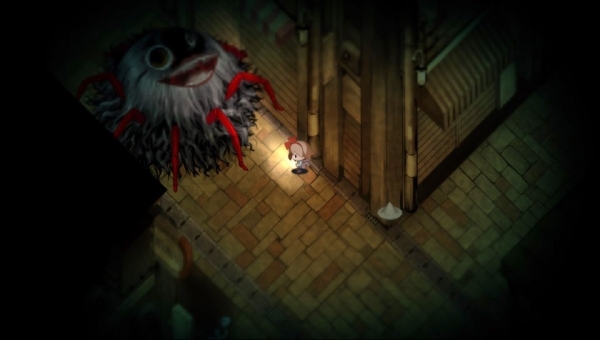 Using a map that Tommy has drawn, the player must make their way round the house, collecting the teddies and trying not to get caught by some form of terrifying creature as it stalks you around the house. This is the Slenderman of Baby Blues, and you'd be wise to avoid it at all costs. • Step 1: Wait for night to arrive. • Step 2: Go in your room and turn off all your lights. • Step 3: Close your door. • Step 4: Wear headphones and turn up the volume. • Step 5: Play in complete darkness. • Step 6: Record yourself getting all the teddies. Can you handle it? If you think so, you can play Baby Blues for free on IndieDB, and any further information you could need to know about this toddler terror can be found on the game’s website and IndieDB. Don’t forget that KGames is also looking for generous donations on its Patreon page. Considering its horror games are completely free, it makes sense to keep them coming with a couple donations! I don't know what it is about cameras, but they tend to make things even scarier than they already are. Think Outlast, terrifying, right? Maybe it's the immediacy and intimacy of the device, forcing you to not only look at, but also record, your worst fears. I imagine that's why [REC] Shutter, by KGames, is a horror played entirely through the screen of a camera. The aim of the game is to solve puzzles as Connor, the journalist tasked with reporting on Penny Hill, a haunted asylum, and avoid as many paranormal entities as possible. By doing so you will learn more about Connor and his backstory, and find out what is happening at Penny Hill. This involves taking photographs of paranormal activity and evidence, but staying at a safe distance. Getting too close will result in high levels of panic (both for Connor and yourself, I imagine), making it harder to control his actions. Panic can be reduced with pills or by making it to a safe area. Failing that, Connor can take only 4 hits before running out of health, portrayed by cracks in the camera, and is sure to keep things tense in those moments of running and panic. The camera also has a night vision option, suggesting that some of this panic may take place in the dark. Bring spare batteries. 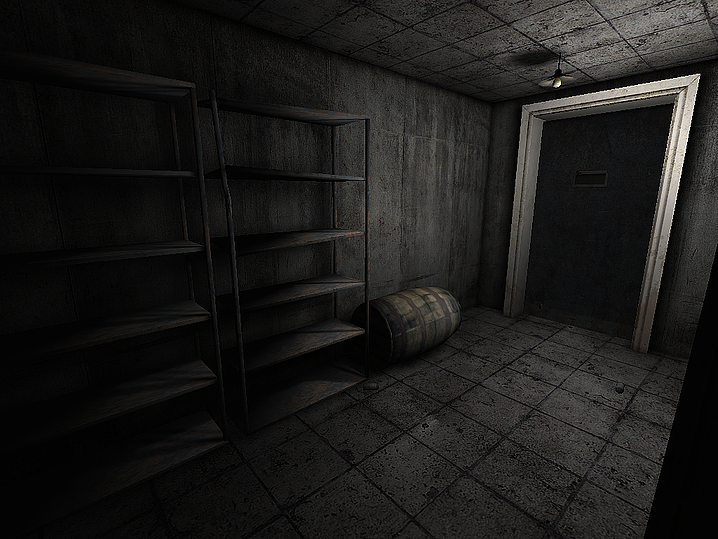 I'm still working my way through the Outlast: Whistleblower DLC, but when I finally work up the courage to finish it, maybe [REC] Shutter is the game to fulfil my found footage horror needs. Anything else you might need to know can be found on the studio’s website, the game’s website, and IndieDB. KGames also has a Patreon, so if you’re feeling generous, check it out. 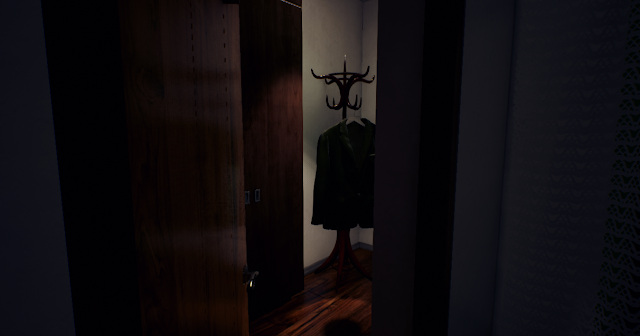 With the cancellation of Silent Hills, and the hype built by its teaser demo P.T, some developers are trying to fill the void for horror gamers. Two such developers are Aleksandar Dzhordzhiyevski and Maxime Thomas, working on first-person horror Stay Close, which aims to blur the line between madness and reality, and was recently Greenlit. 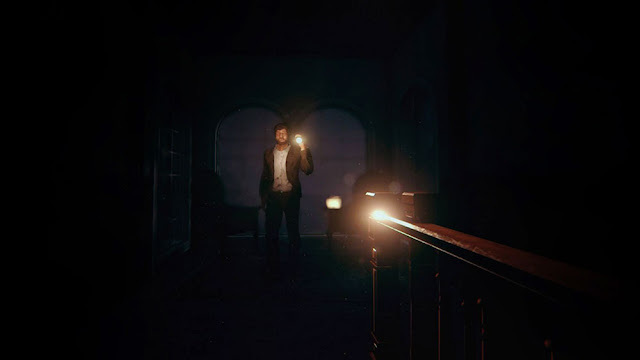 Similar to the teaser demo of P.T, or upcoming horrors of a similar focus – such as Allison Road – gamers won’t be spoon-fed the answers or the narrative behind the game, and will have to piece together what they believe is happening based on the information that they find. Just what gamers will find is not yet clear, as the game is still early in development, but the developers want this to be an important part of the experience. For those planning on staying close to Stay Close, more information can be found on the game’s website, Steam page, Facebook and Twitter. Getting déjà vu right now? That may be because you read this on IGM, where my article was first featured! Check IGM out for all the latest on indie games. Skyhill is a survival horror rogue-like game developed by Daedalic and Mandragora, and has been covered in a news article detailing its release in October. Now, it has been announced that the game will be getting its own Livestream Mode on Twitch.tv from November 28th, allowing streamers and viewers to experience the post-apocalyptic horror together. Not heard of Skyhill before? Gamers step into the penthouse suite of Skyhill Hotel, where Perry was holed up, surviving World War III. Now he is venturing outside of the suite and attempting to make his way out into the world, but he’ll have to fight and scavenge his way through 100 floors of mutants to do so. 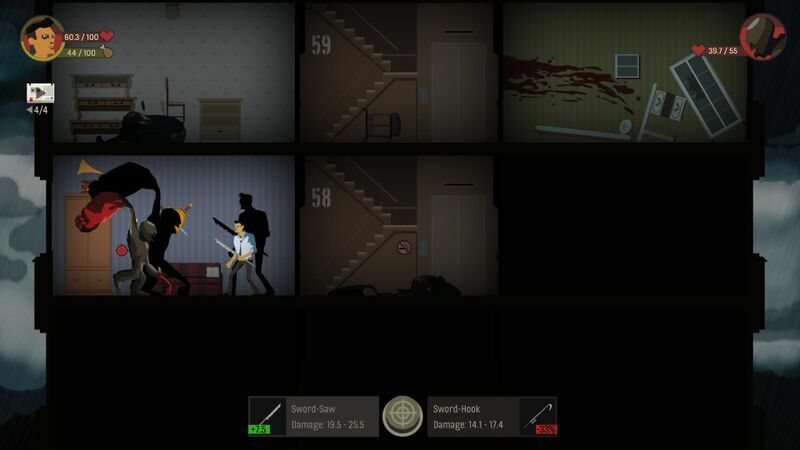 This is the premise behind Skyhill, and each floor is procedurally-generated, meaning that every streamer will be able to share a different experience with their viewers. 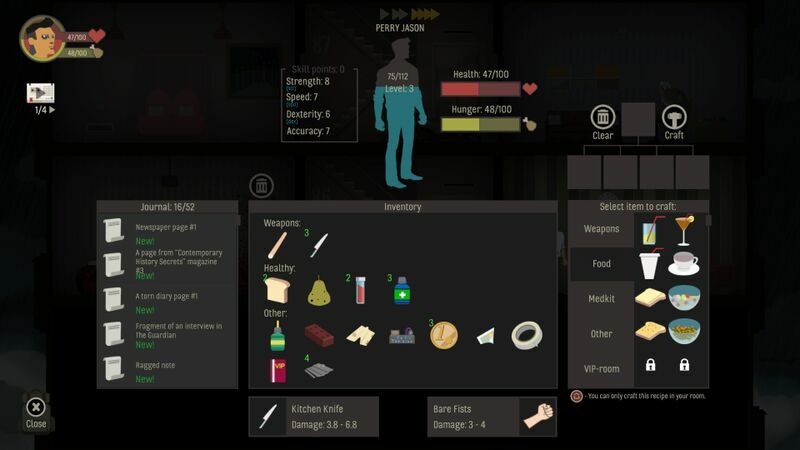 Any furthers update on this feature, or anything else on Skyhill, can be found on the official website, Steam, Facebook or Twitter. Happy streaming. Speaking to developers on Twitter is great. I learn about new games from people that are genuinely passionate about what they do, and really talented at doing it. Then, occasionally, a generous studio will send over a free copy of their game for little ol' me. In this case, the generous studio was Arif Games, and the game was Dark Fear, a pixel horror RPG adventure that's pretty damn addictive. Worried that I might not have time to play much of Dark Fear before writing about it, I let the studio know that I wouldn't be able to guarantee a full review. Little did I know that only two days later I'd get 29% through the game in one sitting... Granted, I only played for about an hour, but I'd still say that's an impressive feat for playing on my mobile. Unless I'm travelling, a mobile game has to be good to keep my attention. Dark Fear is. 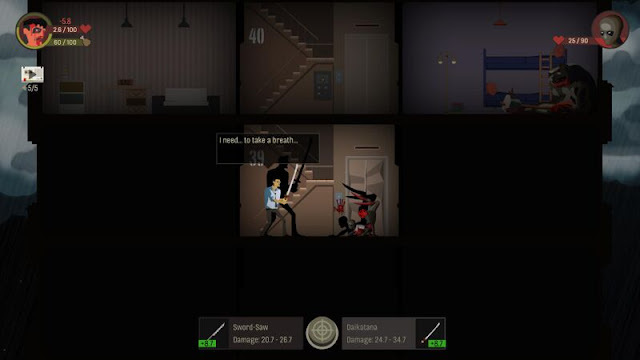 Yes, some mobile games are incredibly simple, aiming to latch onto the success of games like Angry Birds or Candy Crush, but Dark Fear is an adventure of variety and tension. It just so happens to be squeezed into a portable device. It is the variety of Dark Fear that I believe captivated me so during my hour of gaming. 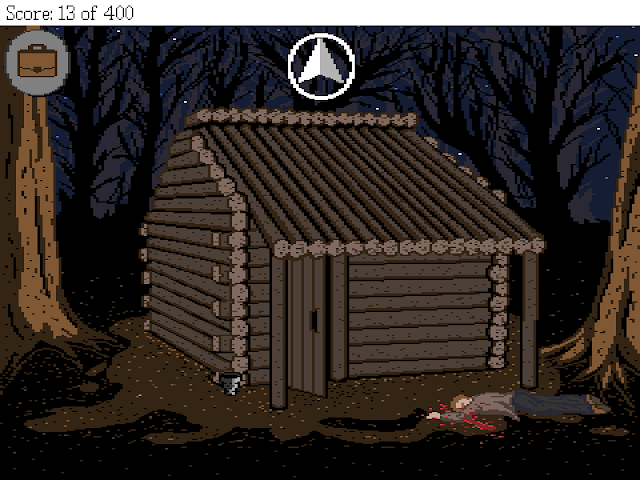 One moment the game was a point-and-click puzzle solver, and the next it was a turn-based RPG where I was fighting off wolves, tree demons and a possessed child (with the added bonus of NPCs, shops, weapons, armour, potions and even a little bit of grinding for money). If you hadn't guessed from "possessed child", the game is also sometimes tense and downright scary. I'm not just talking about when a little girl scuttles across a wall, or runs towards the player shrieking like a banshee, because even the title screen made me jump. It uses a painful screech to announce itself, similar to the opening of the Insidious films, and it really sets the tone of the game. 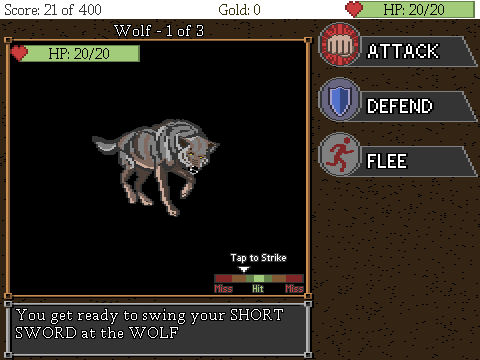 The game is also quite open, especially after making a little progress, and the player is able to choose between a few different locations at their own leisure. 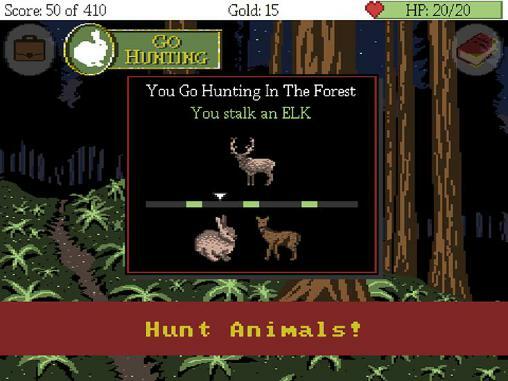 Sometimes they'll want to progress by using something they've found to solve a puzzle, or by talking to an NPC about something they’ve done, but other times they might just go hunting in the woods, catching rabbits, deer and badgers for their fur, and then sell that fur to afford new gear. Carrying out these tasks to upgrade your character is fun, addictive and also makes the moments of tension and horror that much more effective. If you ask me, that should be enough for you to want to look into Dark Fear. What I have played so far was fun enough for me to ignore everything else in my life and home for an hour, playing on my phone in the darkness, and I’m looking forward to playing more. Since you don’t even need to be online to play it (hallelujah! ), this could become your new piece of travelling horror. From what I’ve played so far, Dark Fear definitely deserves a place on your phone. Find out more on iTunes or GooglePlay, and get in touch with Arif Games on Facebook or Twitter, even if it is just to tell them that they are awesome. 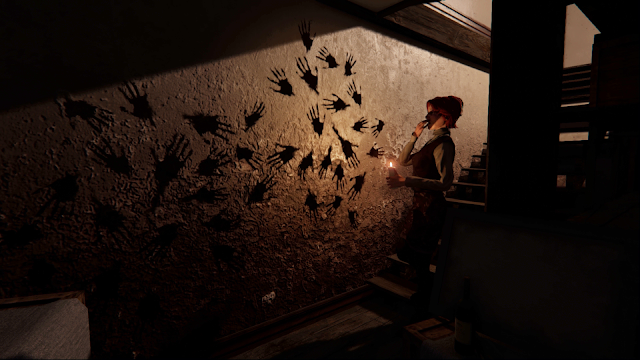 Gamers may not have been alone in the dark for a while, but Frederick Raynal, the creator of Alone in the Dark, has been busy. Having set up his new studio, Gloomywood, Raynal and his team have been developing a stealth horror title called 2Dark, aiming for an early 2016 release on PC. 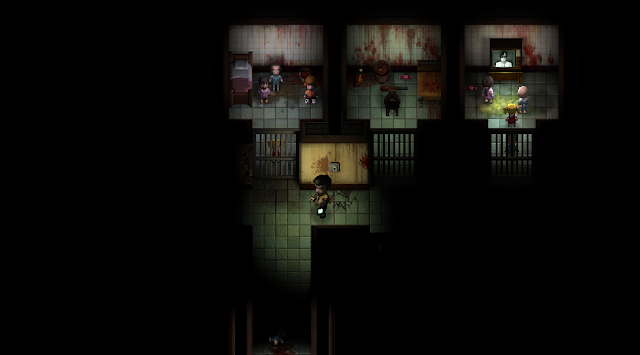 In 2Dark gamers will sneak through a “twisted and quirky 1970’s universe”, attempting to save kidnapped children from the serial killers that stole them away. 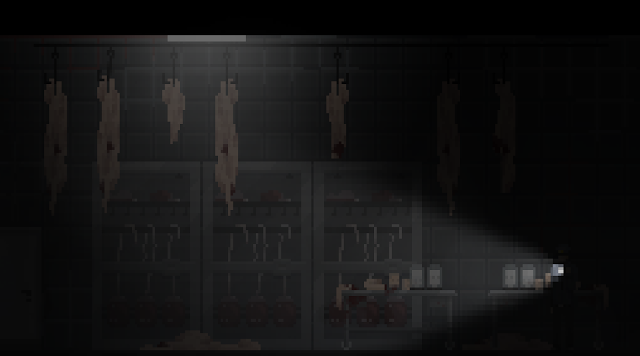 Based on the trailer above, 2Dark shares a few similarities with Hotline Miami games. 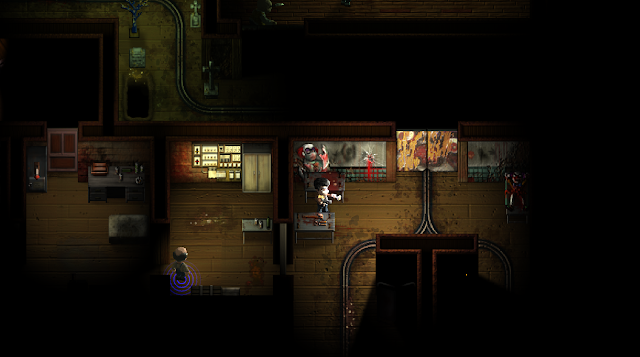 The game features a top-down view of a pixel-art environment, and there are a few disturbing masks in the mix, too. 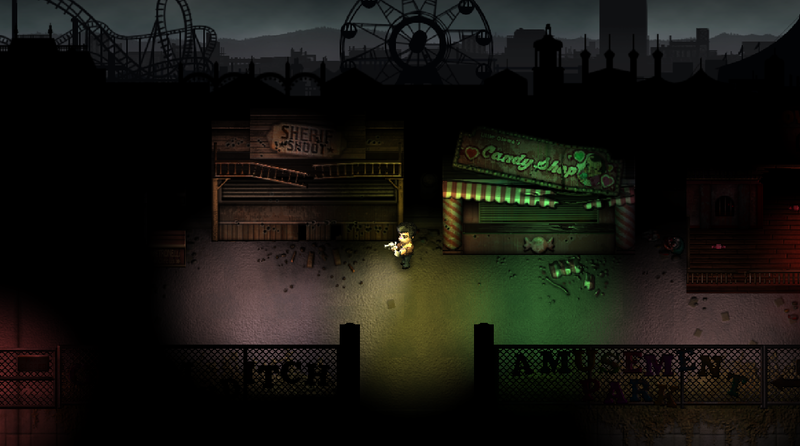 It also appears that sound will be an important focus for 2Dark, as each movement sends out a ring around the player. Presumably, the faster they move, the louder they are, and the more likely it is that the murderers will come a-running. Other than what can be predicted from the trailer, a lot of 2Dark is still, well, in the dark. Anyone that is excited by the premise of what they see can pre-purchase the game for €20 EUR (approximately $21.5 USD) and will be entered into beta. Be warned, though, as the website is mainly in French, and Google Translate can only do so much. When more information is available, gamers are sure to find it at the game’s website, or by “liking” the studio on Facebook and following the studio on Twitter. I'm excited. I'm not just on board the hype train for Protocol Games' Song of Horror, I'm eating snacks from the first-class carriage. In this third-person horror, described as a return to the classic horror of Resident Evil and Silent Hill, with 16 playable characters and permadeath, it is hard not to be. Even more so when it delivers on everything it promises in its Kickstarter campaign. In the press demo I played, Daniel Noyer, the game’s main character, has travelled to Husher Mansion, where renowned writer Sebastian P. Husher lives. Daniel works as the Assistant to the Sales Director at Wake Publishing, responsible for publishing Husher’s writing. The only problem is that Husher hasn't answered the phone in weeks. Daniel was sent to find out why. Finding the front door ajar, he heads inside, and promptly regrets the whole thing. Standing in the hallway, I couldn't help but notice that the game was visually impressive, and the unnerving ambient music emphasised what was to come. The shadows played their part, too. Protocol Games has perfected the game's lighting, and shadows lie in wait everywhere you look, potentially hiding things you won't want to find. Torch shining into the darkness, I already didn't want to take a step forward. 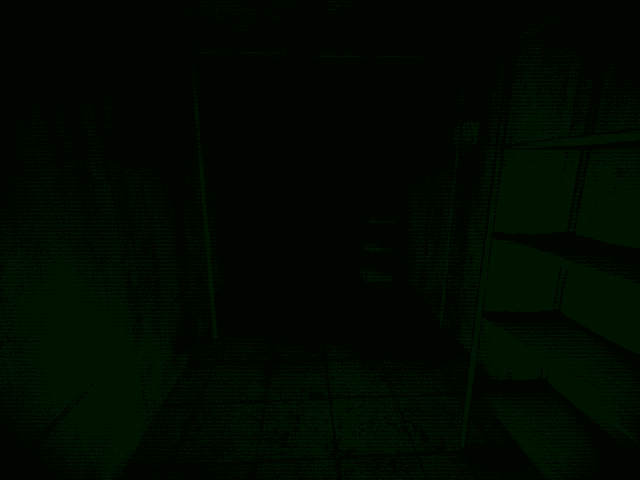 The camera angles used are pulled straight from classic horror games, and always have you wondering what is waiting just out of the screen. These camera angles are also used to great effect when listening through a door, which Daniel can do before going through, if you so desire. Not only is the feature quite powerful in its own right (what might you hear? ), but the camera closes in on the player. As they listen, the half of the screen behind them is empty, and they're left wondering if something is on its way to fill it. This is how classic horror works, both in games and movies, and it's refreshing to see it done so well in a modern game. 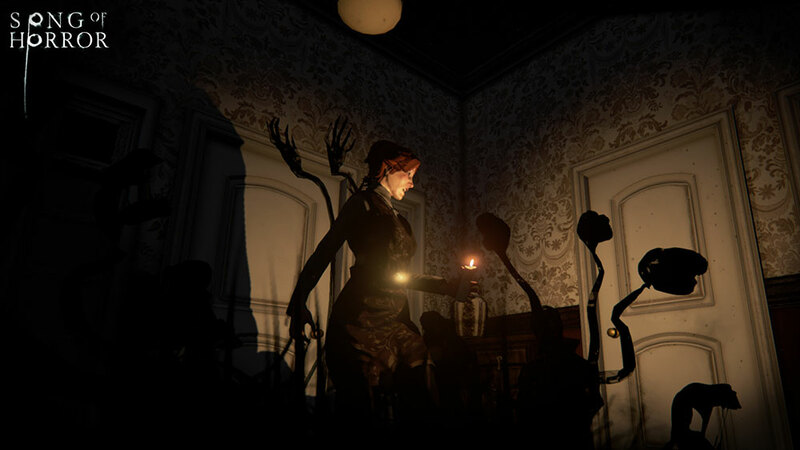 Adding to this sense of unease, and to the game's narrative, are notes and drawings found around the mansion. These include disturbing children's drawings, creepy haikus, and letters between people, giving the player an idea of what took place before they arrived. 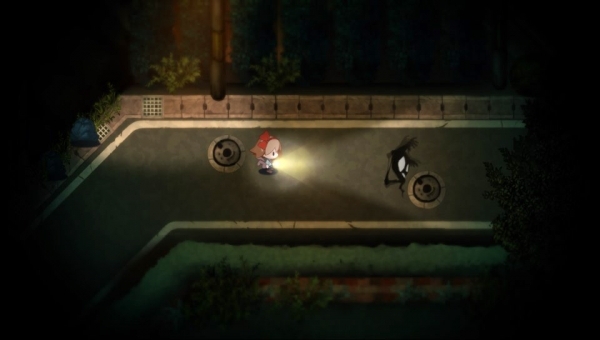 In addition, little references show the studio's love for horror. For example, a piano is branded with "Himuro," which is clearly a reference to Himuro Mansion, a real-life location just outside of Tokyo, said to be haunted, and then made famous as the setting of Fatal Frame. That isn't to say that Song of Horror borrows everything from the old classics; far from it. The game will have 16 playable characters upon release, and with permadeath in place, any of these 16 characters could die, taking the narrative along a different path. I didn't get to experience this in the early build, but I still discovered something new. In some horror games, once you've been scared by something once, you won't be scared by it again, should you revisit or replay an area. Not so in Song of Horror. Even if you revisit an area, the scares may change. One small room had already scared me once, when a ghostly hand reached through the door behind me. Having already seen this, I was ready for it. Nothing happened. Thinking I'd bested the room, I went to leave, only to be startled out of my arrogance by two booming knocks on the door. It was plain cruel. Fortunately, that's exactly what I want from horror. I was sent into yet another unexpected panic when the walls began to ooze and rot, and I was told to "run or hide." The soundtrack ramped up and added to my blind terror. I ran through the house, found a table, and crouched beneath it until the house turned to normal. Well, as normal as Song of Horror gets. Not even a minute later I walked through a kitchen and listened at a door. I heard scratching. Curious, I opened the door and was enveloped by "The Presence," a dark entity that swallowed Daniel into its blackness and left me with a message: “Daniel did not make it...” I hadn’t survived. With 16 characters, this might not have been too much of an issue, but as Daniel is the main character, and the only character in the early build, dying meant failure. Though I may have failed, I am struggling to think of an area where Song of Horror did. My laptop struggled with it, and there were a lot of keys to remember, but that all comes down to the fact that I’m not a natural PC gamer, and neither my laptop nor my key memory is up to scratch. Controller support is available, though, and I’d be using my Steam AlphaWare to play the final game. Problem solved. It may be early in development, but I'm really excited by Song of Horror. I mean, I already was, but having played it, I can see that Protocol Games is really onto something. If you haven't already, I recommend - nay, beg - that you check out the game's Kickstarter campaign. 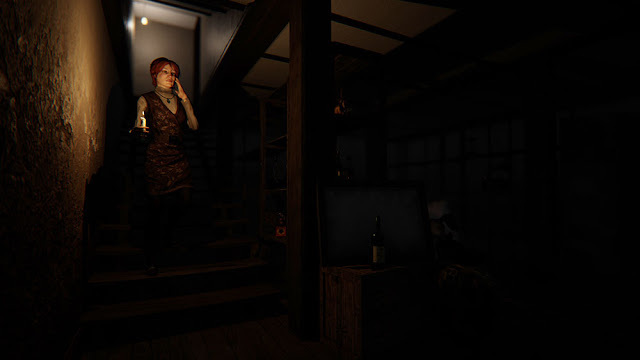 If you've been wanting to return to the days of suspenseful camera angles, an interesting narrative and clever scares, Song of Horror is how you get there. In my opinion, this game needs to happen. It will be good for horror gamers, and potentially even good for the genre as a whole. Keep up to date with everything you need to know by heading to the website, Facebook or Twitter. Just do it. Uncanny Valley is a phrase that refers to something computer-generated or robotic that is similar to, but not exactly like, human appearance and movement, which then creates a sense of unease or revulsion in the person seeing it. Creepy. It is also the title for Uncanny Valley, a survival horror game developed by Cowardly Creations, combining exploration, puzzle-solving and stealth with a strong narrative focus. 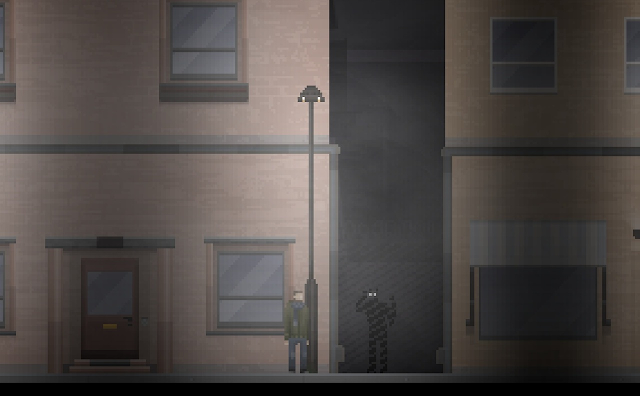 The player will take control of Tom as he starts his new job as a night-shift security guard at a high-tech facility. 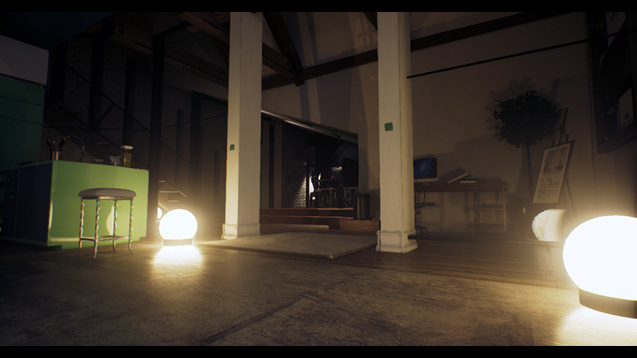 It is during this night shift - set over approximately 7 real-world minutes - that players will be able to explore the facility at their leisure. They can choose to complete the objectives that they have been tasked with on the job, or ignore them completely, choosing instead to explore and interact with the environment. However, thanks to the Consequence System, every action will cause a reaction further down the line. Decisions made and paths taken will shape the narrative, and one player may see an entirely different ending to another player. This also applies to immediate gameplay, and if the player is unable to escape or hide from hostile creatures around the facility, they may be hurt in a way that affects Tom's movement or actions. "For example - you fail at avoiding your attackers, meaning your character will move slower throughout the game, making it harder to escape future pursuers. The player then needs to be more careful and clever, which adds more tension to the game." 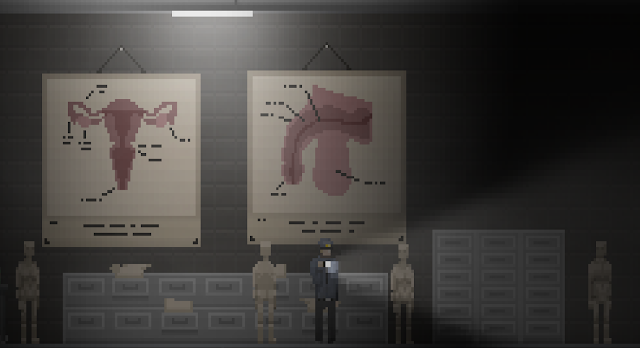 From what I've seen of Uncanny Valley, it looks like a really interesting game. Not only am I digging into pixel-art style, but the amount of interaction and choice with the facility seems impressively open for player choice. And, even better, it's currently on IndieGameStand, where people can pay what they want in order to get the game. SCORE. Hurry, though, as it's only available at pay what you want prices for the rest of the day. If I pick it up, I'll probably end up writing about it, but find out everything you need to know on IGS, the studio’s website, Facebook or Twitter. NeocoreGames just announced The Incredible Adventures of Van Helsing: Final Cut, a compilation of all three titles that will bring over 50 hours of gothic-noir steampunk action-RPG to Steam. In The Incredible Adventures of Van Helsing, gamers explore Borgovia, a gothic land of “monsters, magic and weird science.” They do so using one of six playable classes with different professions, ranging from “steel and gun” to magic and science, and are able to use these skills to fight off creatures with their own tailored style. Players will also be able to build their own hideout, defend it with a tower-defense mini game, take part in daily or weekly quests and challenges, and join others in co-op and PvP multiplayer modes. More information on this gothic ARPG can be found on the website, Facebook or Twitter, and the game can be purchased on Steam for $44.99 USD. Beware, gamers. Jason Voorhees has been unleashed. On Friday the 13th, with some perfect timing, Gun Media's Friday the 13th: The Game was successfully Kickstarted. 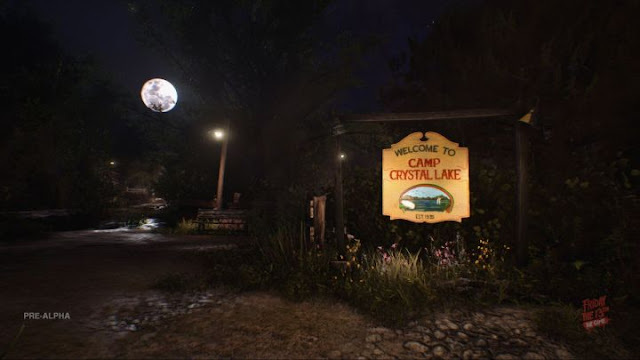 The campaign was aiming for $700,000 USD and reached $823,704 USD, meaning that backers not only unleashed Jason upon Camp Crystal Lake, but they unleashed a few stretch goals, too. 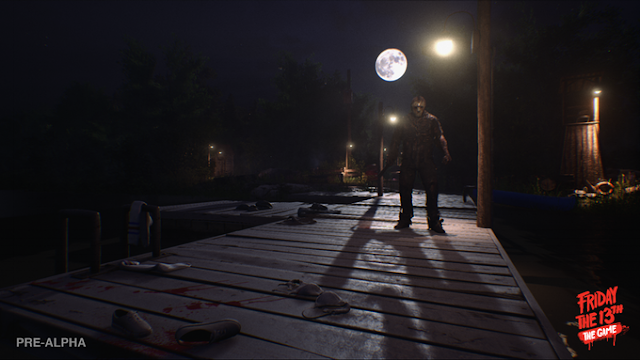 In case anyone missed IGM's Fridaythe 13th news, here's the lowdown. Friday the 13th: The Game, formerly known as Summer Camp before merging with the slasher franchise, is an asymmetric online 7v1 multiplayer. Seven players control counsellors, each with their own stats and abilities, which progress over time. 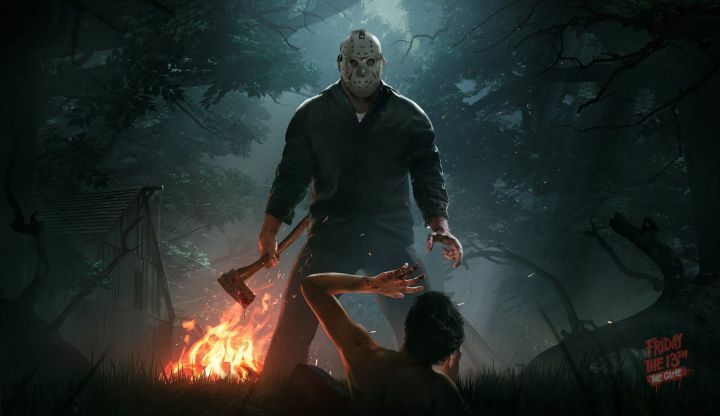 While they're doing their best to fight, escape and survive, one player hunts them down as Jason, with his own set of skills for picking them off one-by-one, just like in the movies. Thanks to the backers behind the Kickstarter campaign, the game will have a few extra surprises from the movies, too; namely, well-known kills. Upon reaching $700,000 USD, the famous sleeping bag kill was unlocked, followed shortly after by stretch goal additions such as a mirror smash, head crush and ripping hearts from chests. Jason, of course, is no stranger to any of these. 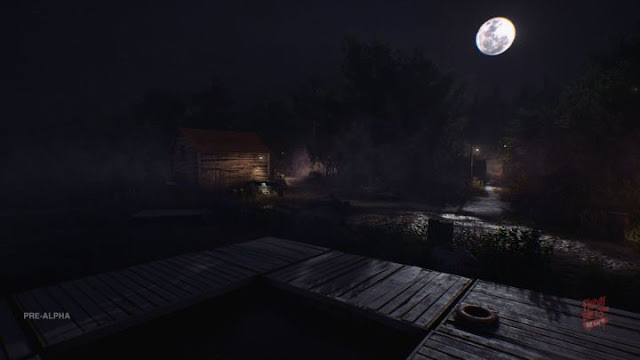 Friday the 13th: The Game is being developed for PC, Xbox One and PlayStation 4, for release in Fall, 2016. Those that backed $40 USD or more can expect to join the beta, though there is no date for when this may be ready. More information can be found on the website, Facebook or Twitter. For those interested in all things Friday the 13th: The Game, don't go too far; Jason has a way of coming back.